Alison Stone won the 2003 Many Mountains Moving Poetry Book Award for They Sing at Midnight. She also published Dangerous Enough (Presa Press 2014) and From the Fool to the World (Parallel Press 2012). Her poems have appeared in The Paris Review, Poetry, Ploughshares, Barrow Street, Poet Lore, and a variety of other journals and anthologies. She has been awarded Poetry’s Frederick Bock Prize and New York Quarterly’s Madeline Sadin award. Please visit Stone's website. Get it at SPD Books or through MMM Press directly. 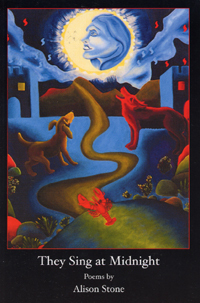 She is also a painter and the creator of The Stone Tarot. A licensed psychotherapist, she has private practices in NYC and Nyack. She is currently editing an anthology of poems on the Persephone/Demeter myth.